The Dashwood sisters are the opposite in character and temperament: Marianne (Kate Winslet) is all heart and romanticism, while Elinor (Emma Thompson) is all reason and prudence. 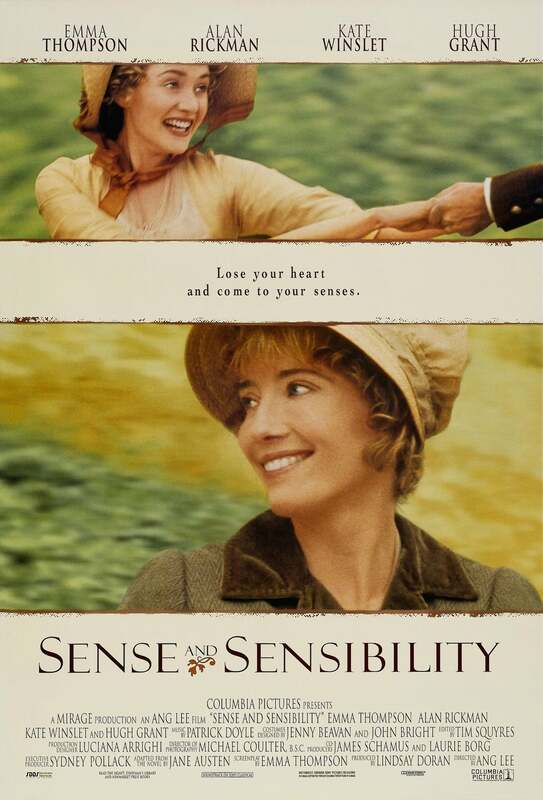 Based on Jane Austen's 1811 novel, Sense and Sensibility played on this soul/mind duality, promoting a resurgence of Austen and a series of high-profile film adaptations from her books (see Emma and Persuasion). At the 53rd annual Golden Globe Awards, Sense and Sensibility, written by Emma Thompson and directed by Ang Lee, won two Globes (Best Film – Drama, and Best Script for Thompson), out of six nominations. Thompson also won the Oscar for her script. Thompson – who had won both Globe and Oscar as Best Actress in 1993 for Howards End – marked a first in the history of both Awards: with her Best Adapted Screenplay Academy Award, she became the first and still is the only woman to receive Globes and Oscars for both acting and writing. At the Globes, in the Best Actress – Drama category, Sharon Stone won for Casino (Susan Sarandon, also nominated for Dead Man Walking, went on to win the Oscar that year). Winslet was nominated for Best Supporting Actress, but Mira Sorvino won for Mighty Aphrodite. The other nominated films (Drama) were Braveheart, The Bridges of Madison County, Apollo 13 and Leaving Las Vegas. Mel Gibson won as Best Director for Braveheart. In her clever acceptance speech, Thompson read her thank yous as if they had been penned by Austen herself. When she got around to naming Columbia-TriStar studio chief Mark Canton, the actress observed that the author felt she was owed money – a remark that drew laughs from the industry-savvy audience. Ang Lee originally was considering young, “pre-Titanic” Winslet for the smaller part of Lucy Steele, even though she really wanted to play Marianne. When Winslet arrived at her audition she pretended that her agent had sent her to read for Marianne, and her feisty reading won her the role. There is an ironic twist surrounding the casting of Winslet, Thompson, and Greg Wise (who played John Willoughby in the film). Winslet and Wise dated briefly before Wise started dating Winslet's on-screen sister, Emma Thompson. Thompson and Wise were together for eight years before getting married. Together they have two children. A nice ending which Jane Austen would have surely loved to have written herself.